The Jesse wall hung cupboards above are a great idea for creating some extra storage space, taking everything up and away from the floor. 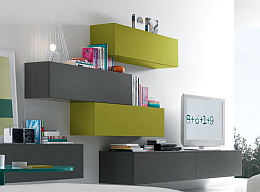 They can be bought singly or used as part of a complete wall of units. They’re also extremely easy to mount on most walls with the doors arranged to lift-up or pull-down, while cupboards can be hung side by side with one single top. They’re great for media storage too with channels for cables etc. If you’re always falling over shoes and boots maybe it’s time to think of creating some dedicated storage for them. Something that’s easy on the eye and even easier for, say, the average teenager to get the hang of. Porada’s Girilla shoe cupboard is an incredibly practical, mirrored, wall mounted cupboard. The two front sections open up to reveal 12 adjustable metal shelves perfectly angled to store your shoes or boots. But if the thought of fitting wall units and cupboards before Christmas makes you reach for the drinks cabinet… maybe look at introducing a few smaller things to help. Italian manufacturer Bonaldo creates fabulous designs with everything from sofas to dining tables and beds. They also think about the smaller things too and their ‘Secret’ ottomans , new this year, are extremely cool. They come in three sizes and have loads of practical storage space underneath the padded lids, which also make extremely comfortable seats. They can be upholstered in matching material, or you can mix and match textures and patterns to suit the design of your room. They’re fab for storing newspapers/magazines, toys, or throws and cushions. Not quite big enough for packing away relatives but there’s always a first! 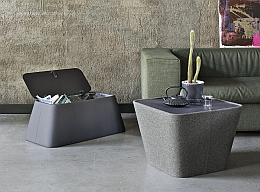 Likewise, Bontempi Casa has designed a clever and stylish collection of coffee tables called Lounge, with loads of inner storage space. 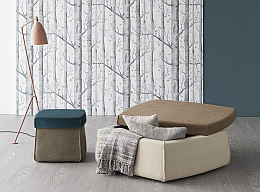 They’re made in wonderful shapes and great materials: the lift up lid/tabletop is made from lacquered aluminium with oodles of colour choices and the sturdy wooden frame can be upholstered in lots of different fabric from eco-leather to wool. So, a few ideas there from us. 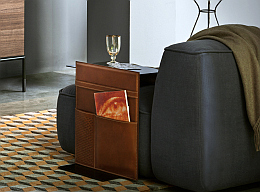 For more ideas, including our very stylish Note side table with clever side pockets for pens and papers, check out the decluttering post on the Homes & Gardens website.